The fun & excitement all starts with a call or an email! We deliver anywhere in the United States or Canada! A 50% deposit of the cost of the playhouse & all selected options is required to initialize your order and build your playhouse. When your deposit is received, finalization of your options, hand painting & color selections will be made. Approximate delivery date will be confirmed at the time of your order. PA residence will pay a 6% sales tax. 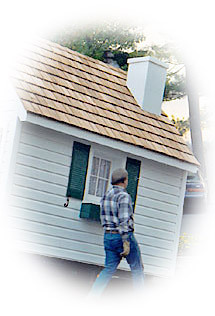 The most frequently selected colors for your playhouse are as follows: pale pink, yellow, white or gray house with white trim & shutters. Window boxes are available in black, dark green or dark gray. If you so desire, you may choose custom colors at no extra charge. Please refer to Benjamin Moore® color charts for color name and number. You are responsible for preparing the site prior to delivery. Please see our site foundation preparation guidelines. We are not responsible for damages or shifting of the house for improperly prepared foundations. We must have a level foundation because of the weight of the house (approx. 2,000 lbs.). Concrete block perimeters at ground level, a concrete slab, or a gravel pad are all adequate. We will give you the dimensions for the size of the playhouse. Pressure-treated 4 x 4's support the frame and rest on the foundation. Failure to prepare the site properly may result in delays or additional charges. The shipper needs 10' wide and 14' high clearance to the site. Forklifts and cranes have been used in some situations. Any concerns about the foundation or delivery can be discussed with Signe's Little Houses and shipper prior to delivery. Our trucker is a specialized Signe's Little House deliverer. He will deliver the house - fully assembled - to your site. Signe's is not responsible for damage to lawns, shrubbery, plants, etc. during delivery. The buyer is responsible for clearing a pathway not less than 10' wide by 14' high to the final site. Buyer agrees to inspect the house upon delivery and report any damage to the trucker prior to his departure. Once unloaded and inspected, buyer agrees to accept the house in delivered condition. The balance of the invoice cost of the playhouse is due upon delivery. The house will not be unloaded from the truck until payment has been received by our trucker. The check should be made out to Signe's Little Houses. We assume no liability after the playhouse has been delivered to your site. The purchaser is responsible for choosing a structure and accessories appropriate for the developmental levels of the children who will use them. Routine inspections, preventive maintenance and play supervision are all the responsibility of the homeowner to ensure a play environment that is free of hazard or injury.